Italian yard Canados Yachts has revealed that the Canados 969 Coliseum is ready to go into production now that the pre-engineering phase has been completed. The hull mould has been finished and construction will begin before the end of the year, with a 2018 completion date targeted. Developed in collaboration with Marco Casali, this raised pilot house yacht measures 29.5 metres LOA and has a beam of 6.62 metres. The Coliseum 969 is the largest superyacht project that Canados plans to build in 2017 under its new French owners. Accommodation is for up to ten guests, split between a full-beam main deck master stateroom, two VIP suites and a further two double cabins, while the crew quarters allow for a staff of up to four people. The aft deck features a central gangway, allowing for two tender garages, one houses a four metre tender and another can store a pair of Jet Skis. Further forward, the full-beam saloon allows for a 65-inch television screen and a pair of symmetrical L-shaped sofas. The master suite is comparable to a 35 metre yacht, Canados claims, with a split-level bathroom offering a shower, sauna, vanity unit, and his and hers en suites. 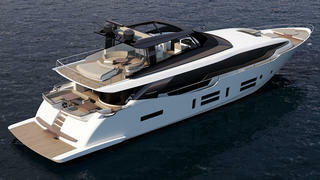 The first Canados 969 Coliseum will be built with twin 1,990hp MAN V12 diesel engines for a top speed of 26 knots. 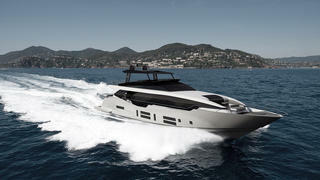 The total fuel capacity of 9,750 litres means a cruising range in excess of 600 nautical miles at 23 knots. A Seakeeper stabilisation system would be fitted as standard, along with a sliding fabric roof. Exterior relaxation spaces are plentiful, including a convertible foredeck seating area, which can be set up as either a dinette or sunpads. The Canados 969 Coliseum was announced at the Cannes Yachting Festival, when the Italian yard also revealed that it is working on six new projects for 2017, including the Canados 808 Maximus motor yacht and the Oceanic 95 GT.